Due to the lack of retention on ODS columns, oligosaccharides have typically been analyzed on specialty sugar columns. We have successfully analyzed inulins using COSMOSIL Sugar-D, a specialty column for saccharide analysis, and PBr, a unique reversed-phase column for polar and non-polar analytes. 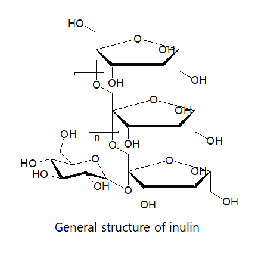 Inulin structure Inulin (G-Fn-F) is a polysaccharide composed of a glucose unit (G) bonded to multiple fructose units (F). It is an indigestible, water-soluble dietary fiber, abundant in the roots of chicory and tubers of Jerusalem artichokes. Recently, oolong tea with inulin has been released as a functional food in Japan on the basis that inulins feed intestinal bacteria by forming short-chain fatty acids and facilitate the peristaltic movement in the bowels. In the literature as well, there are references to inulin's effect on bowel movements.